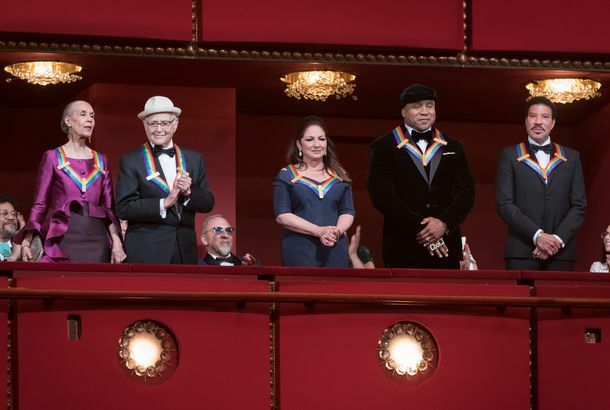 The Kennedy Center Honors Were a Happy, Trump-less CelebrationIt was the first time a president has missed the occasion in 23 years. The Walking Dead Goes to Lip Sync BattleIt’s Lauren Cohan vs. Sonequa Martin-Green! Jimmy Fallon Remakes ‘Going Back to Cali’ VideoCali. Cali. Cali. LL Cool J Will Rap With Strangers in the AirportLadies do love him. Andy Cohen Does Cher on Lip Sync BattleWillie Geist countered with some Dolly. This Is the Best Thing Cara Delevingne Has Ever DoneLL Cool J never sounded so good. Male Gaze: LL Cool J’s Abs of SteelBecause all the Ladies Love Cool James. And the 2013 Grammy Nominees Are …Lots of Frank Ocean and fun. Watch Neil Patrick Harris Impersonate LL Cool JIt’s all fun and games at CBS! Chuck Schumer Is a Big Fan of ‘L.L. Kool Herc’Bet you didn’t realize Schumer was so into hip-hop! Watch LL Cool J’s Grammy Promo With Nicki MinajNichols and May, watch your back! The Grammys Have a Host This Year, and That Host Will Be …LL Cool J.
LL Cool J Battles Banana Pudding; Four L.A. Chefs Nominated by Food &The rapper admits he has a weakness for junk food. Hear LL Cool J Cover Bill Withers, ‘LLovely Day’Eek. Last Night on Late Night: Alec Baldwin Dishes on Tina Fey’s ConquestsAnd Jon Stewart pulls a Britney, on our regular late-night roundup. Toby Keith Wasn’t Interviewed by Sarah Palin EitherWill there be any ‘guests’ left on the show by tomorrow night? LL Cool J Cut From Sarah Palin’s Show in Sassiest Way PossibleFox News mocks Mr. Cool J’s acting career and devotion to inspiration. Sarah Palin Is Now in a Rap BeefLL Cool J feels used. Vampire Weekend Guy Dreams a DreamPlus: Bill Paxton is so tired of all these wives. Video: Awkwardness Always Reigns at the People’s Choice AwardsWho else is going to give George Lopez the chance to make a series of awkward Mr. Skin jokes on national TV besides the PCAs? Goldman Sachs Announces $3.44 Billion ProfitDon’t call it a comeback. Kate Hudson Wore a ‘Disguise’ to the Manhattan Polo Classic This WeekendShe needn’t have bothered — Madonna didn’t care that she was there, anyway. And more in our gossip roundup. The Economy Takes Down Celebrity Fashion LinesWe can’t say that makes us sad. ‘Runway’ Recap: Who Does Kenley Think She Is?She insults Tim Gunn and blames Leanne for why her work sucked. Not okay. New Cure Remix EP Nearly As Bad As Robert Smith Said It WasPlus: What’s Nelly up to these days? Lily Allen Acts Civilized for OncePlus: New music from Feist and LL Cool J!